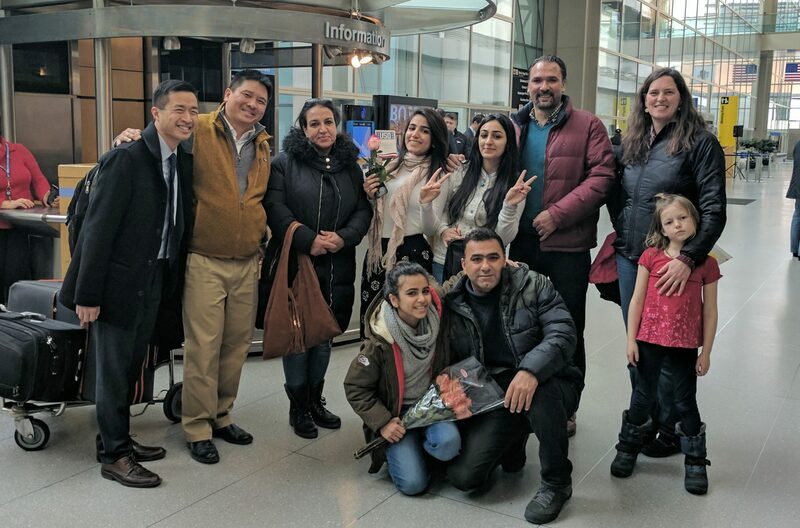 When President Trump signed an executive order in January banning travel from seven predominantly Muslim countries, one family in Portland, Maine, was watching every development with concern. They had arrived from Iraq just three days earlier, and now they wondered if they’d ever again see the daughter they’d left behind. To them, her life was at stake. The father of the family, Labed Al-Hanfy, sits on a wooden chair with his eyes closed while he strums the oud in his brother's living room. 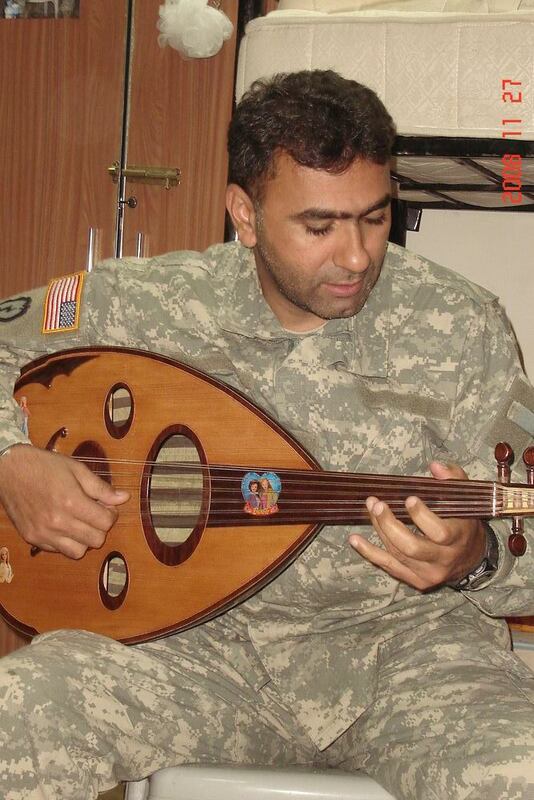 He used to play the stringed instrument for American troops in northern Iraq, when he served as an interpreter. Back then, he knew his work for the U.S. made him and his family targets of terrorists. Labed says things got serious when he learned that two of his neighbors in Baghdad were killed for collaborating with the U.S.
Labed applied for a special visa for Iraqis who had worked with the U.S. military. In late 2016, their visas arrived, and Labed’s family could immigrate to the U.S. There was one problem. The visa for Banah — Labed’s 20-year-old daughter — was missing. It had been held up for some reason. 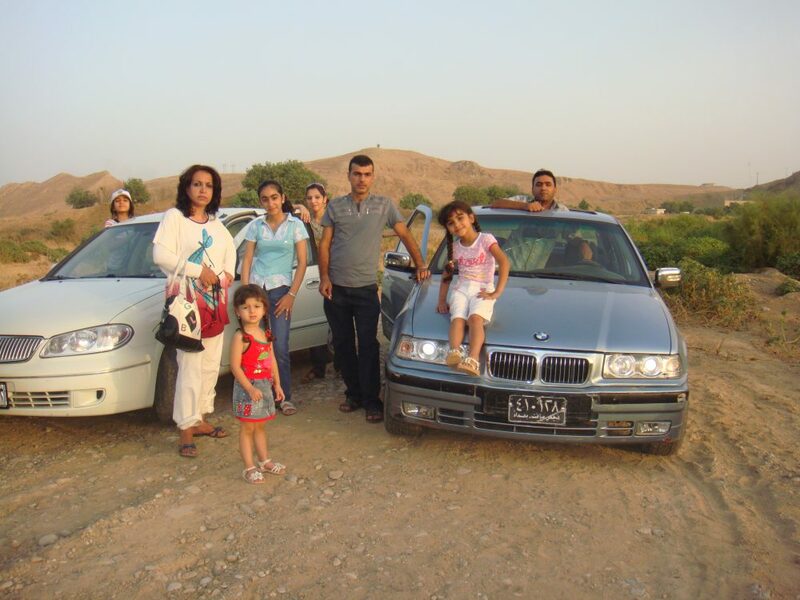 Labed and his wife made the difficult decision that it was too dangerous to wait in Iraq. So they and their two younger daughters fled their home in the middle of the night to travel to Portland, Maine, where Labed’s brother lived. Banah stayed behind with her grandparents. 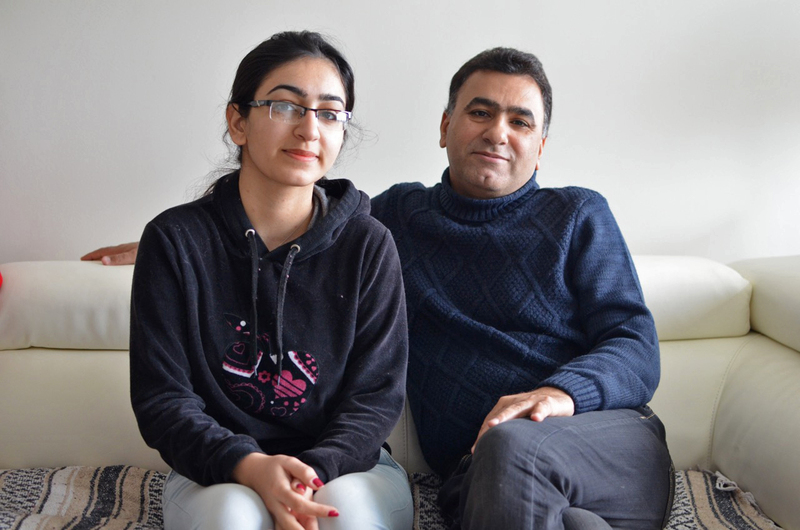 Banah hid in her grandparents’ home and worked on travel arrangements. Then, three days after her parents and sisters made it to Maine, Trump signed the executive order that banned Iraqis from traveling to the United States. Banah was confused and scared. She’d already booked flights to the U.S., but now airlines wouldn’t tell her whether she’d be allowed to fly, and she didn’t know what would happen to her. Labed knew they needed help. So back in the U.S. he walked to the office of the local newspaper, the Portland Press Herald, and told his story. It made the front page. That got the attention of Adam Burk, a 37-year-old community organizer in Portland, and Brian Eng, a real estate developer in his 40s. Brian and Adam had only met once, but they were Facebook friends. “I saw Adam Burk repost the article on Facebook,” Brian says. “You know, Labed had served our country. Sort of on a patriotic level, I was upset by that. And then as a parent, I was also emotionally reacting to the idea that you could be separated from your child in this way. I put a comment on his post, 'Let’s figure this out. I’ll buy the plane tickets.'" The next night, Adam and Brian met Labed and his brother, and they all started to plan. “In the Starbucks as they were closing up," Adam says, "chairs were going up on tables and they were trying to mop, and we were trying to have this serious conversation that had a lot of implications." There was a lot to sort out. Brian says he must have sent hundreds of emails and texts as they assembled a team of Portlanders who wanted to help. They also enlisted a lawyer, who told them that a judge had blocked Trump’s order for flights coming into Boston. For the first time since the ban was signed, Labed felt optimistic. "It seemed to be like a hope or a light at the end of the tunnel," he says. But things were about to get much more complicated. For one, airlines were reluctant to fly Iraqis like Banah. The team knew that every day, Baghdad became more dangerous for her, and that ruling by the judge in Boston would only last a week. "The whole week was very terrifying," Banah says. "I didn’t know what to do. Nobody knew what to do." Finally, the team found an airline, Lufthansa, that would take Banah. They booked flights for the next morning, Thursday, Feb. 2, while President Trump’s ban was still blocked. "So the plan was to meet at Becky’s Diner at 5 a.m., kind of our command central to deal with problems as they arose," Adam says. "Before we even got there, we found that Banah couldn’t get on the plane." So with just hours to go, and Banah waiting at the airport, Brian got back online, and after some frantic searching, he booked a new itinerary for that very day. Banah would fly from Baghdad to Doha to Istanbul to Frankfurt to Boston, each connection with its own hurdles. Then, the team waited. "It was tense," Adam says. "I don't remember breathing very much while we sat there." Finally, they got word that Banah was on her last flight, and they all drove from Portland to a mobbed Logan Airport. Brian remembers seeing the first person come through the door who had been affected by the travel ban. It was Banah. Banah hugged her parents and her sisters, the family she had feared she would never see again. "It was very emotional, because people I never saw in my life, never talked to, they helped me come here," Banah says. "I learned from them, helping others is the feeling of being human. All I wish is I can do the same in return to all the people in the country." The end of this story is really a beginning. Banah plans to attend college in Maine. Brian feels tied to Labed and his family, and Adam and his son have started going to community meetups to learn Arabic. "For me, the gift has been to get to know this family, and feel like I’m part of their story now," Brian says. Labed never expected that a group of strangers from a country he’d lived in for just three days would do so much, but now, he says, they’re connected. Permanently. "Here is our home," Labed explains. "These are our family. Our destiny is like their destiny, and this is it." Find us on Facebook or Twitter, or email kindworld@wbur.org to share your story. You can also subscribe to the podcast. This segment aired on March 14, 2017.